This article was published in 2005, but is still relevant today, especially in the context of the current military intervention in Iraq and Syria. In June 2005 I attended the National Media Reform Conference in St. Louis, Missouri. While there I visited the historic St. Louis courthouse and the huge Gateway Arch by the Mississippi River that symbolizes St. Louis as the gateway to the west. It was here that US corporate agribusiness, the US occupation of Iraq and the Dred Scott decision intersected in reality as well as symbolically. The St. Louis courthouse is famous for the deliberations of Dred Scott in the mid-1800′s and displays in the courthouse feature the historic documents of this renowned court case. Scott was a slave and sued for his freedom, which was denied by the Missouri Supreme Court. The U.S. Supreme Court upheld the decision in 1857. The court ruled that Scott was not a citizen and therefore could not bring a case to a federal court. In the same case, the court also ruled that the Missouri Compromise that forbade slavery in new territories was unconstitutional as it denied the rights of slave property owners. The decision had sweeping consequences, not the least of which being yet another catalyst for the initiation of the Civil War. Interestingly, two months after Supreme Court decision, Scott’s present owner freed him anyway. Standing under the Gateway Arch, and looking west, one sees the old St. Louis courthouse, and to the east, the Mississippi River. As I looked across the river there was, to my amazement, a warehouse-like building with a huge rather crass sign reading “Cargill”. It was obviously a decadent marketing ploy by the agribusiness giant, the Cargill Corporation, that is the largest grain trader in the world. The Cargill sign was, therefore, in a direct path, underneath the arch, to the courthouse. I mentioned this disturbing image across the river to one of the park stewards. She said, “Yes, there are times I would like to bomb East St. Louis.” I thought that was a rather interesting comment. As is now well known, oil is but one of the major interests the US has in Iraq. Because wars are invariably a pretext for economic expansion and opportunities for corporate greed, I knew that US corporate agribusiness was not about to be left out of the picture. My concerns were realized when, in April of 2003, Bush’s Secretary of Agriculture Ann Veneman appointed Daniel Amstutz, formerly an executive of the Cargill Corporation, to oversee the “rehabilitation” of agriculture in Iraq. 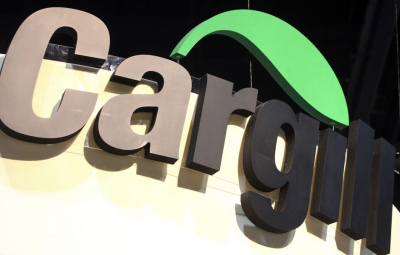 With Cargill having the reputation of being one the worst violators of the rights and independence of family farmers throughout the world, I knew Iraqi farmers were doomed. Amstutz, however, brought additional corporate and international trade qualifications to the table. He was undersecretary for international affairs and commodity programs from 1983 to 1987 for the Reagan administration; ambassador and chief negotiator for agriculture during the Uruguay Round General Agreement on Tariffs and Trade (GATT) talks 1987-1989; and past president of the North American Grain Export Association. None of these qualifications were encouraging for the well being of the small family farmers in Iraq. I also knew that, as the US was poised to invade Iraq, US corporate agribusiness companies engaged in producing and promoting genetically modified organisms (GMO’s) throughout the world would be salivating. Why would corporate agribusiness be salivating??? Some history here. It is thought that agriculture started 13,000 years ago in the Fertile Crescent – in the area now called Iraq – where the Tigress and the Euphrates rivers intersect. The Iraqi ancestral farmers and this fertile land brought us major crops such as wheat, barley, dates and pulses (see Jared Diamond’s “Guns, Germs and Steel: the Fates of Human Societies”). The area is hugely important in world history. Given they are considered the initiators, for thousands of years the contributions of the Iraqi farmers to the world’s agriculture production system have been unquestionably profound. It is also likely that women were the initiators of agriculture. Women were the gatherers in hunting and gathering pre-agricultural societies. As women were the ones gathering nuts and roots for their communities, they would have been the observers of seeds and their growth patterns. This is likely why the majority of the African farmers today are women and throughout our human history the world’s farmers have largely been women. Now comes the corporate connection. Food is something everyone needs. There is no question about this and no need for a survey – the market is a given. Huge profits are in the offing. Controlling all aspects of food ­ its production, packaging, distribution and commodity markets – is the dream world of corporate agribusiness. The major impediment to corporate agribusiness controlling all aspects of food and then reaping all of the profits, however, is competition from the independent family farmer in the US and throughout the world. Throughout our history, the family farmer’s controlling interest has been protected by two of the most important components of agriculture ­ the two “s’” ­ soil and seeds. Soil is not monolithic. It is amazingly and thankfully diverse. It’s components and minerals differ everywhere and farmers historically have always adjusted to this through crop rotations that will add or remove certain nutrients to the soil, and/or farmers will let the soil rest and lay fallow for a specified time. Traditional farmers will also use natural nutrients like compost and manure to replenish the soil. In this way the soil remains “alive” with organic nutrients, earthworms and the like. Seeds and plants are also selected for the type of soil and farmers themselves have performed, and still perform, this selection since the beginning of agriculture. Seeds are also not monolithic, of course, even within the same plant family. They are amazingly diverse and the diversity of seeds is our lifeblood. Like humans, plants are vulnerable to disease. The more diverse our plants, the safer we humans are. The more diverse our plants, the less vulnerable they will be to an all-encompassing disease that could and has wiped out some crops within days or less. Without diversity there is virtually no resistance to disease. The great Irish potato famine in 1845, for example, resulted from a uniform potato production that had no resistance to the potato blight. Also, farmers have always historically saved seeds for next year’s crop. Most farmers in the world don’t go to the store and supply warehouse to buy seeds. The seeds are their on their farm and their grandparents, great-grandparents and great-great grandparents likely grew versions of the same seed stock. The mission of farmers historically and around the world has always been to grow food for family and community sustenance, and not competition against each other – a mission that is much to the ire of western capitalists. Invariably, farmers will also share their seeds with their neighboring farmers. This collective and cooperative spirit of the farming community is legendary. It is well known and documented that small farmers everywhere are the best stewards and sustainers of the land. They are closer to itthey know what it takes to feed it and care for it. I’ve seen farmers lift soil in their hands and know exactly what is needed in the soil. In this sense, small family farmers are also the most efficient farmers in terms of crop yields, as virtually every foot on that farm is known to them. To be sure, millions of farm families ­ women, men and children – throughout the world from the Philippines to the US are sophisticated homegrown agronomists who work the fields. I can easily be accused of romanticizing the farming profession, but I’ve seen farmers with a glow in their eye when talking about being involved in one of the most sacred of all professions ­ the practice of nurturing and witnessing the flowering of crops from small seeds and, consequently, sustaining all of us through the production of food. The world’s family farmers now and historically are our unsung heroes! So what has corporate agribusiness done to disrupt the powerful soil-seed mantra and erode the independence of family farmers? Chemicals were employed that neutralize and invariably have polluted and poisoned our soil, which destroys its diversity. Seed patents have been intensified, coupled with the development of genetically modified organisms (GMO’s). Corporations have attempted to make farmers dependent on all of these interventions. After WWII there were vast amounts of nitrogen left over from making bombs. Dow, Shell and Dupont decided they could sell the nitrogen to farmers for profit and thus began the now infamous “green revolution” leading to huge amounts of chemical poisons in agriculture. The complicity of the U.S. Department of Agriculture in the green revolution is also a major factor. The result has been a devastating farmer dependency on chemical poisons along with the destruction of our soil and leading to us humans ingesting more chemicals (read Al Krebs’ excellent “The Corporate Reapers: the Book of Agribusiness” – 1992). The chemical and poison additives in soil make it easier for seed business’ to disregard the diversity of our fertile soil which then paves the way for less diverse and genetically altered seed stocks. Farmers who have used these poisons, and are now attempting to veer away from this dependency, describe their soil as “dead”. It can become alive again, but it takes a few years. There’s a vicious war against family farmers right now that is relentless. Companies will even sue if farmer’s non-GMO crops have been polluted by GMO pollen and are planted without permission (see the 2005 report by the Center for Food Safety entitled “Monsanto vs. U.S. Farmers”). What corporate agribusiness is attempting to do to independent family farmers is not quite slavery but becoming close. It is attempting to take away the independence of farmers through basically contract farming. This harkens back to the oppressive sharecropping or tenant farmer relationships set up by southern plantation owners for freed slaves and poor white farmers in the South. Plantation owners wanted to keep freed slaves under their yoke and make use of their labor. So they set up a sharecropping and tenant systems of farming with various types of contractual arrangements that invariably benefited the plantation owners rather than the aspiring freed slaves. So, too, it’s the consolidated corporate agribusiness companies that benefit in today’s scenario rather than the farmers. Throughout southeast Asia, destabilization of traditional farming practices from corporate agribusiness intervention has been rampant. In the late 1980′s, for example, I spent time with rice farmers in the Philippines. They told me that they were encouraged to grow a new higher yielding rice plant developed by the International Rice Institute, and it’s affiliated corporate agribusiness companies. They were excited about growing and potentially exporting more rice. It made no sense to them that they could not set the seed aside for next year’s crop, as Filipino farmers have done for hundreds of years. It also made no sense that the only way the crop would be fertile was through use of fertilizers supplied by agribusiness companies. Such chemical use was also an unknown practice for these farmers. The next year, hundreds of the small rice farmers went out of business because they couldn’t afford to purchase the seed or fertilizer. I asked them why they didn’t go back to planting their old rice crops. They told me they couldn’t because they didn’t have the seeds anymore as the seed had always been set aside for the next year’s crop. As a result they were dependent on agribusiness for their seeds ­ there was no option. Most of the traditional Filipino rice seeds are now in U.S. seed banks. In the late 1990′s there were reports of some 4,000 Filipino rice farmers who died due to pesticide (chemical poison) use. The speculation, I was told by Food First in California, was that the higher yielding rice plant attracted a pest the farmers had never before encountered and they were then told to use chemical poisons that they also had never used. It’s thought that either they didn’t know how to use the poisons or they used it to commit suicide. Most of the world has resisted, in some way, the wholesale invasion of GMO crops. No country in their right mind would turn over their food sovereignty to US corporate agribusiness. Not to be defeated, corporate agribusiness has sought loopholes in vulnerable areas in the world. They seek regions where the implementation of their insidious schemes is virtually a given and from which they can force the world to accept their devastating and destabilizing agricultural model. Currently, the US military occupied Iraq is a prime area and the continent of Africa is another. Corporate agribusiness is enormously dangerous and the increased, sometimes forced, dependency of the world’s farmers on corporate agribusiness is a threat of major proportions. Think of it ­ virtually all of our ancestors were farmers and for 13,000 years we humans have fed ourselves quite well without the likes of Cargill and Monsanto that evolved just decades ago. We don’t need them! To further exacerbate the problem, they make us all vulnerable for their short-term corporate greed. As Jim Hightower, the populist and former Agriculture Commissioner of Texas, once said, “We need to place our nation’s growth not on the Rockefellers but on the little fellers because is we do it will be based on genius and not greed.” This should be the message for every nation! Of necessity, most agriculture advocates would agree that agriculture should remain primarily local and not global. This is the essence of food security – locally controlled and produced food. The symbolism, much less the reality, of making Iraq’s fertile crescent into one of the major areas for GMO production would be altogether too tantalizing for corporate agribusiness companies like Cargill and Monsanto. Dan Amstutz obviously had input into the disastrous “transfer of sovereignty” policies developed by the former Coalition Provisional Authority (CPA) administrator L. Paul Bremer III in Iraq. Of the 100 orders left by Bremer, one is Order 81 on “Patent, Industrial Design, Undisclosed Information, Integrated Circuits and Plant Variety”. Most are saying that this order, if implemented, is a declaration of war against the Iraqi farmers. Upon reflection, I decided this lineup of US corporate agribusiness and the Dred Scott decision is appropriate. It is appropriate that they face each other as they are obviously in league. To combine this with the US military occupation of Iraq and the attempts at corporate agribusiness abuse and control of Iraqi agriculture is mind-boggling. All three represent a combination of greed, unjust ownership (humans, seeds etc.) and violations of immense dimensions that impact the integrity and safety of the planet and its inhabitants. We managed to legally end slavery in the United States but it took a war to do so. Today, the world’s independent farmers also need to be freed from the oppressive yoke of corporate agribusiness and the on-going efforts to intensify and expand this control. Regarding our food system overall, it is too important to be handed over to unfettered capitalists and food should not be treated like any other commodity. Agriculture and small farmers are just too important to us. Let the corporate capitalists perhaps make shoes or combs or computers, although they are probably making a mess of that as well by destroying competition. But by all means we need to keep their slimy hands off the substance of life – the world’s agriculture production system. Heather Gray produces “Just Peace” on WRFG-Atlanta 89.3 FM covering local, regional, national and international news. She has been a part of the food security movement for 16 years in Africa, Asia and the United States. She lives in Atlanta, Georgia and can be reached at [email protected].